Germans are feeling good about their country ahead of a national election on Sept. 24 that will determine whether Chancellor Angela Merkel leads her nation for a fourth consecutive term. Unlike many of their fellow European Union members, Germans are satisfied with the state of the economy and are broadly positive toward the political establishment that has led the nation through the post-World War II era. An overwhelming 86% of Germans believe their economy is doing well, up from 75% last year, according to a Pew Research Center survey conducted in spring. Views of the economy have been consistently positive since 2011, reflecting Germany’s quick recovery from the global financial crisis. By comparison, just 2% of Greeks, 15% of Italians, 21% of French and 28% of Spanish say their economies are doing well. Germany boasts one of Europe’s lowest unemployment rates – just 3.7% – while neighbors like Italy struggle to pull unemployment into the single digits. And growth of Germany’s gross domestic product accelerated in 2017, building on several years of positive economic growth. 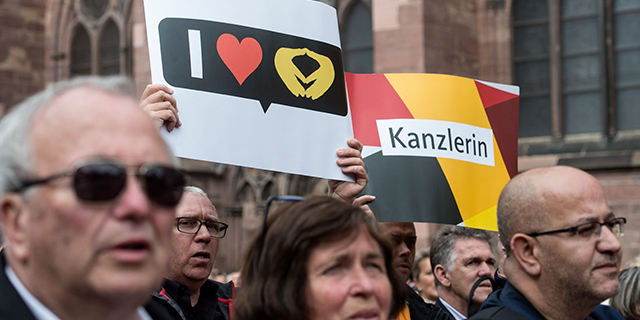 On the political front, Germany’s mainstream parties enjoy widespread support. A 58% majority have a favorable opinion of Merkel’s center-right Christian Democratic Union (CDU) and a 68% majority like the center-left Social Democratic Party (SPD). This stands in stark contrast to France, Greece, Italy, Spain and the UK, where all political parties tend to be unpopular. The right-wing populist Alternative for Germany (AfD), on the other hand, is extremely unpopular. More than eight-in-ten Germans have an unfavorable opinion of the AfD, with 55% saying their view of the party is very unfavorable. Despite the AfD’s lack of popularity, political observers expect the party to win enough votes to secure representation in Germany’s parliament for the first time. The AfD, known for its Euroskeptic views and strong opposition to immigration, is more popular among Germans who dislike the EU and those who see the large number of refugees leaving countries like Iraq and Syria as a major threat to their country. Men, those without a college degree and those on the right of the political spectrum are also more likely to hold a favorable view of the AfD. As Germany expands its international role, the vast majority of the public (81%) is also feeling good about Merkel’s capacity to do the right thing on the world stage. However, demographic groups differ somewhat in their trust of the chancellor’s international leadership. Germans ages 50 and older have more confidence in Merkel than their younger counterparts and women are more likely to feel this way than men. Despite the chancellor’s center-right political orientation, those on the political left are actually 11 percentage points more likely than those on the right to say they have confidence in Merkel’s ability to deal with foreign affairs. Confidence in Merkel’s approach to international affairs is quite high in Northern and Western Europe. And globally, Merkel earns more confidence (a median of 42% across 37 nations) than Chinese President Xi Jinping (28%), Russian President Vladimir Putin (27%) or U.S. President Donald Trump (22%).